Greg Slaughter is 6’11”. That’s the height of Goliath. But when he drove down the lane and jumped, ready to slam a dunk—he was blocked! A thin-reed player named Codilla, eight inches shorter, sprang his legs upward and skyrocketed to block the ball and embarrass Slaughter. The crowd erupted. Eyes enlarged. It was the play of the game. The game? Six-time defending champions University of the Visayas (UV) versus the University of San Carlos (USC). 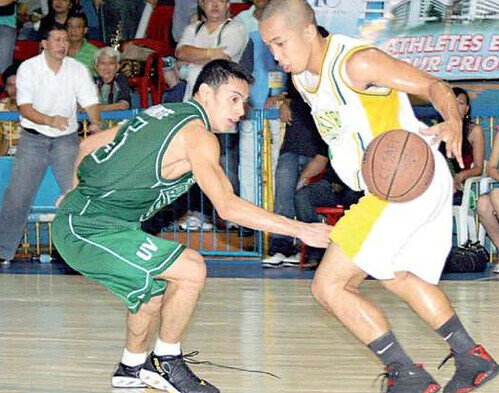 Can the CESAFI finals be any more thrilling? Last Thursday from 5:30 to 8 p.m., I sat at ringside beside fellow Sun.Star writer Marian Baring. The Freeman’s Caecent No-ot Magsumbol and Cebu Daily News’ Jonas Panerio sat near. Behind were the two Gullas cousins, Jiji and Didi, owners of UV. CESAFI Commissioner Felix Tiukinhoy sat across, beside Atty. Frank Malilong. Holding the game microphone was Deputy Commissioner Rico Navarro. We saw two teams with the same color green. But one team loomed tall and large: UV. Apart from Slaughter The Giant Slayer, there was Rico Berame, another behemoth who stood 6’8”. The rest of the team were six-footers. Even coaches Elmer “Boy” Cabahug and Al Solis stood tall. That’s UV. USC? Slim, thin, youthful but—and an important asset—much quicker. 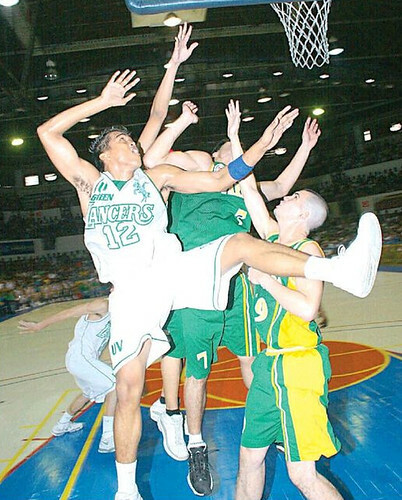 Against Goliath, all USC players were first-named “David.” Led by the outstanding point guard Paul Joven and the energetic and aggressive play of Niño Ramirez, who top-scored with 27, the USC Warriors looked like a high school squad against the six-time defending collegiate champs, UV Green Lancers. But right from the opening shot, USC led. First with a 7-0 burst. At first quarter’s end, they led 22-18. Same during half-time, USC led 41-34. In this CESAFI finals, they were down 2-1 in a best-of-five series and if they lose Game 4—they’re gone. So USC played with energy. Just like their head coach Jay Ramirez, who barely sat down and screamed plays and held his arms up and showed unbridled emotion—his team played with the same vigor and spirit. USC’s Enrico Llanto, who, just minutes before the game started was proclaimed season MVP (his second in a row), showed why he’s tops. Whenever he held the ball, he never panicked. He took a few seconds to ponder, he’d dribble, then maneuver, then score. He scored 16 points. The Cebu Coliseum crowd? I’ve watched PBA games there but never a crowd as inspired as last Thursday’s. Drums rolled. The fans of the green-and-yellow team would chant, “GO, USC! GO, USC!” Seconds after, the fans of the green-and-white team would counter, “UV! UV! UV!” Next, USC screamed, “DEFENSE… DEFENSE!” Then, the UV band played the Sinulog beat. But the warriors inside USC wouldn’t allow that. They scored, then scored again until the seconds ticked and when the buzzer sounded, USC won, 80-77. But wait. Before anybody celebrates, last Thursday’s game—though a thriller—is nothing compared to 3 p.m. today. It’s Game 5 with the winner to be declared champions. My pick? Call me biased: My dad finished at USC. So did my brother Charlie, sister-in-law Michelle and, just last June, I enrolled at USC to pursue a Masters in Education degree. So, I’d betray my school if I say I wouldn’t want UV’s long reign to end. Go, USC! Remember this when you face Goliath: David won. hello,,,you play so nice….i really like your team..especially if si viilanil nay muduwa..